While the drought state of emergency is over for the time being, water conservation remains a way of life in California. The prolonged drought prompted local water agencies to embark on a plan of costly upgrades to their aging infrastructure in an effort to maintain a reliable water supply, resulting in dramatic rate hikes. At the same time, sewer service rates have been increasing as municipalities struggle to comply with clean wastewater regulations. These rate increases disproportionately affect high volume users, such as commercial laundry operations, forcing them to try to find ways to reduce their water usage and waste. Rising electric and gas rates are also adding pressure to the bottom line. One answer for commercial laundry operators is to invest in modern, high efficiency industrial laundry equipment that uses significantly less water and energy compared to older technology. Western State Design (WSD) is an industry-leading supplier of this high efficiency laundry equipment. WSD has considerable experience working with large scale commercial laundry clients and understands their needs. One such client is Lace House Linen Supply, a successful, commercial linen service provider, based in Petaluma, CA, serving hotels big and small, restaurants and caterers, retirement homes, and spas and salons. The 4th generation family-run company has been in business for over 100 years. 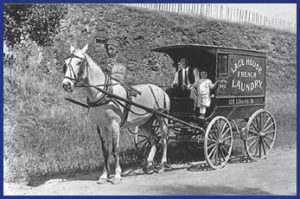 Established in 1915 to provide family laundry services, the business has grown over the years and continues to pride itself on its integrity, personal service and quick response to customer needs. The company’s list of 500 plus customers includes some who have been with them for over 50 years. While Lace House customers appreciate their high level of service and superior laundry outcome, they are blissfully unaware of what goes on behind the scenes to make that happen. As noted, it’s not easy to run such a successful, large-scale laundry operation in water-challenged California: it requires a lot of sophisticated, high capacity industrial laundry equipment, and space to accommodate it. That’s where WSD steps in. Martin Pharis, a WSD laundry specialist, has been working with Lace House for many years, providing expertise and operational support. Martin, an engineer with more than 30 years of experience in commercial laundry operations, knows his stuff; he has played an important role in Lace House’s growth and success. In 2004, the company moved its operations into its present 25,000 square foot state-of-the-art facility. According to one of Lace House’s owners, Phoebe Ellis, Pharis and other WSD experts were instrumental in designing and developing this new space. The plant’s automated systems include a full complement of connected washers, dryers, ironers, and folders, as well as water and wastewater handling systems integral to the operation. 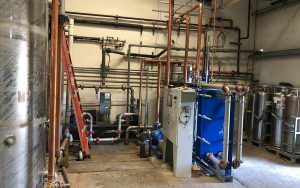 As California water issues started becoming more pervasive and problematic a few years ago, Lace House decided they needed a much more efficient water and heat reclamation system and they turned to WSD’s Pharis for help. 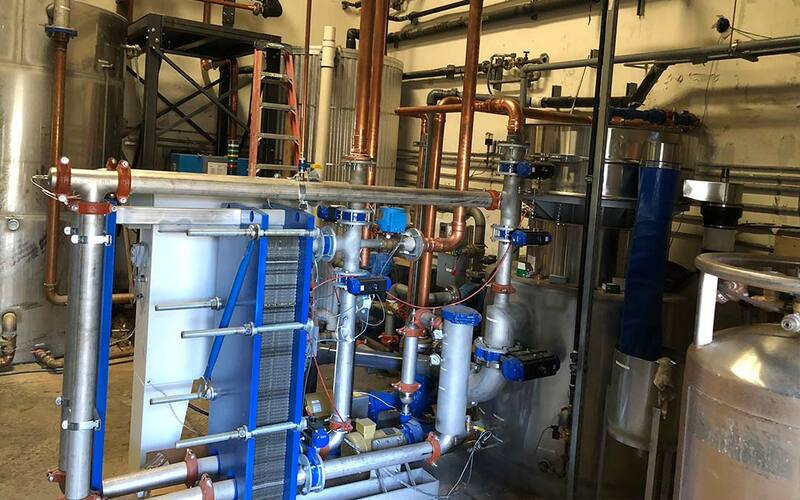 Pharis helped with the design, specification, and installation of a TR-4 state-of-the-art wastewater heat recovery system from Thermal Engineering of Arizona (TEA). This system will enable significant energy, utility and chemical cost savings. The system will also increase the supply of hot water, allowing for expanded laundry capacity which equates to more business for Lace House. The TR-4 system is the most efficient industrial heat reclaimer available. It preheats both the hot and cold-water make-ups to the high temperatures specified by the washer manufacturers. The system recovers approximately 50% more heat than a hot water-only heat recovery system. Among the many features of the system is its modular design which accommodates additional thermal plates to readily increase its capacity. Automatic flow controls. Automatic control valves match supply and demand to achieve maximum heat recovery at any plant production level. Fully automatic self-cleaning controls to maintain performance at optimum levels. The TR-4 system is eligible for rebates from Lace House’s local utility, PGE. Pharis is working directly with PGE as the client’s sponsor, to secure these rebates. The TR-4 system was only recently installed, so it’s too early to calculate exact savings. But, Lace House’s Ellis says she can already see a substantial increase in laundering efficiency. Due to increased water temperatures, wash times have been cut almost in half. Ellis also lauds how user-friendly and low maintenance the new system is. She explained that the folks from TEA did an incredible job training all their in house engineers and staff on system operation. For more information about WSD’s line of high efficiency, commercial laundry equipment can help your organization increase laundry productivity and reduce costs, please contact a WSD Laundry Expert today.